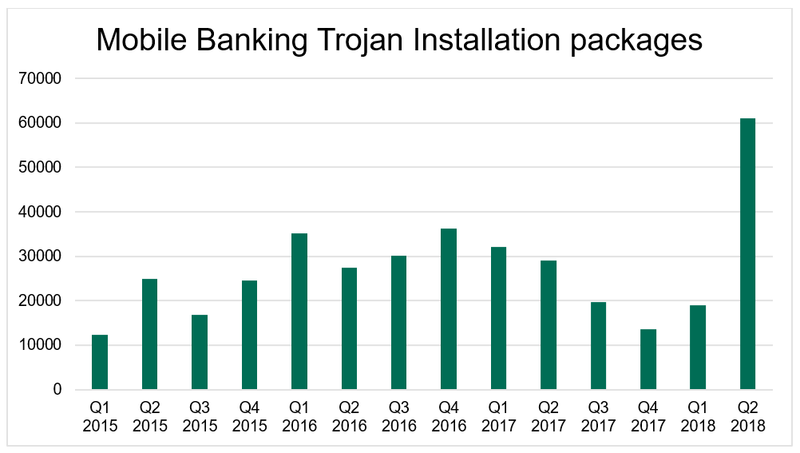 • Mobile banking Trojans hit the list of cyber-headaches in Q2 2018. In Q2 2018, the top three countries with the biggest share of users attacked with mobile banking malware as a proportion of all users attacked with any kind of mobile malware, was the following: USA (0.79%), Russia (0.7%), and Poland (0.28%). Russia and USA changed places compared with Q1 2018, while Poland jumped from 9thplace to 3rd – mainly due to the active distribution of Trojans.AndroidOS.Agent.cw and Trojan-Banker.AndroidOS.Marcher.w modifications. Kaspersky Lab mobile security products also detected 1,744,244 malicious installation packages (almost 32% growth against previous period). Do not perform the rooting procedure of the device that will provide cyber criminals with limitless capabilities.